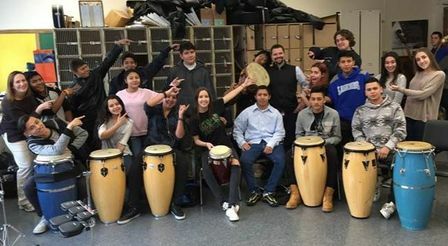 Hearts PW proudly sponsored world-renowned Uruguyan percussionist Pablo Rieppi, who presented three hands-on Latin American hand-drumming workshops to Schreiber ENL students and AP music theory students. These sessions taught the students to understand and perform culturally and musically important Latin rhythms. Weber 7th graders and Schreiber's TV and Film Production students had the unique experience of spending a day with entertainment industry makeup artist Michael Maddi. Through an assembly, slideshow, Q&A and workshop, Maddi shared his secrets for transforming actors and actresses into older versions of themselves, as well as monsters and villains, among other looks. 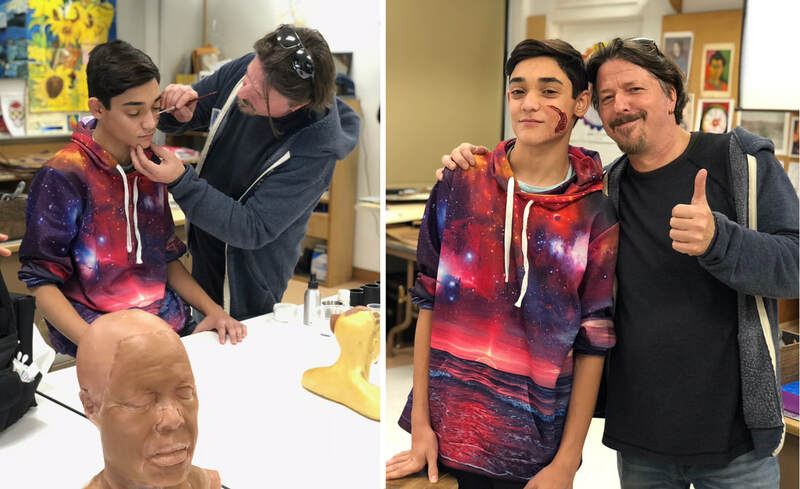 Students had the opportunity to get up close to samples, including a first-hand look at a mask that Maddi created for the famed villain “The Joker” on TV's Gotham. Maddi’s presentation educated the thoroughly engaged students about opportunities for a career in the arts. This fall's Curtains Up: Musical Theater Workshop featured more than 50 4th and 5th grade students from all five local area elementary schools performing popular songs from musicals across the decades. Selections included "There’s No Business Like Show Business" (Annie Get Your Gun), "It’s a Hard Knock Life" (Annie), "If You Would Only Listen" (School of Rock), "Ease On Down The Road" (The Wiz), and “Footloose” (Footloose), among others. The event also featured a special performance by Curtains Up program alumni Carly Gold, who just finished the national tour of the musical Fun Home and sang "Ring of Keys" for all in attendance. Standing ovations for Program Coordinator Emily Baxter, Director Lauren Blank, and Musical Director Jake Glickman for their dedicated work on this program. Salem Elementary School first grade students had the opportunity to participate in this eight-week, in-school, hands-on, dance residency workshop in West African style dance. Enthusiastic students learned about the unity between the body, mind and spirit that is fundamental to African culture. Students also learned regional songs along with dances of welcome and praise culminating in a performance. 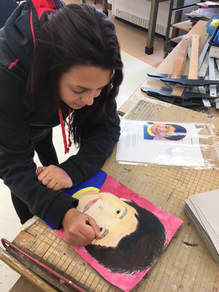 Update: Grant application for the 2018-18 school year is available now. Completed applications are due March 5, 2018. HEARTS is thrilled to partner again with the Creative Arts Department of the Port Washington School District, the HSAs, and the Ed Foundation to bring the amazing Dancing Classrooms program to all Port Washington fifth grade students. Children from all five elementary schools are stepped outside their comfort zones and learned essential life skills through the art of social dance.